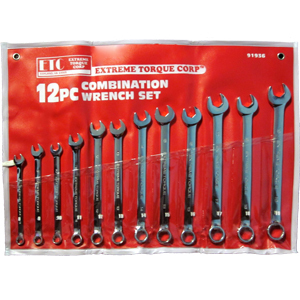 Made to last, the Extreme Torque 11-pc Metric Combination Wrench Set features drop-forged, heat treated high carbon steel with a polished, corrosion-resistant, triple chrome-plated finish. Fastener head on 4 sides applies more torque than standard wrenches. This set comes in a handy, roll-up storage pouch. Extreme Torque wrenches have a lifetime warranty and replacements are available individually.